The Sunset Park cooperatives are in the news again! YES!, a nonprofit magazine that promotes “a just and sustainable world,” published an article about the Beyond Care Cooperative. Read the whole article here. If you are interested in Beyond Care’s services, check out their web site. In September, the We Can Do It! Cooperative was featured on CNN and recognized by the Congressional Hispanic Caucus in D.C. In recent months, the coops also appeared on the TV show On the Money, on NPR’s Weekend America and in Indypendent magazine. In May 2009 I attended the Brooklyn Food Conference at John Jay High School and PS 321 in Park Slope. The conference was organized by the Brooklyn Food Coalition, a grassroots initiative that aims to increase access to sustainable, healthy and delicious food for all. With over 2,500 people in attendance, the event was such an incredible success that organizers started thinking and planning for the next steps almost immediately. In the last few months there has been a large effort to reach out to multiple neighborhoods in Brooklyn to get residents, workers, activists, and others involved in their particular neighborhood groups. Neighborhood groups have been discussing and selecting issues that concern them. Some of the issues that have been chosen by groups include getting healthier lunches in schools, organizing community gardens, food coops, and addressing workers’ rights issues. 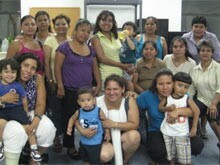 In September, we had our first Sunset Park Neighborhood group meeting at the Sunset Park Recreation Center. About 20 people attended, mostly organizers and activists at local organizations. Unfortunately the meeting attendees did not fully represent the diverse demographics of Sunset Park. A few of us made sure to bring this up and made a commitment that we would all recruit more workers and residents from Sunset Park. The main themes that were brought up by the attendees were workers’ rights issues, access to fresh food, and education around nutrition and various types of foods that are sold at green markets and community gardens. The next meeting will be on Monday, October 19th at the Adult Employment Center of Center for Family Life (443 39th Street, 3rd Floor), where we will decide which issues we will tackle as the Sunset Park group. Anyone and everyone is welcome to join us for the exciting venture into the food world! For more information about the upcoming event, contact me at (718) 633-4823.